Wonder Wandz are made with wooden parts and are decorated with ribbons of all styles and widths. The ribbons are 36″ long. 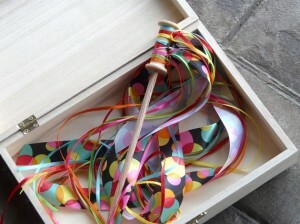 The wand measures approximately 9.5″ and fits inside the “magical” box. 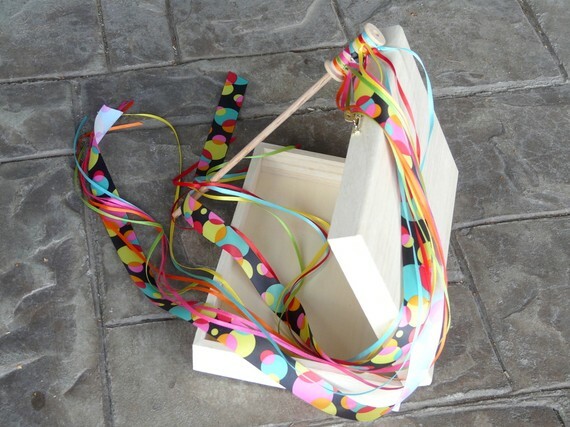 “The hinged and latched box makes the perfect home and hiding place for such a marvelous piece of play!” And why not have your children decorate and personalize their magical boxes? I just customized Wonder Wandz for my children simply by asking “Lightning Bugz,” a dollmaker, quilter, writer, imaginative toy maker, and all around creative genius, to craft two with only the following for color inspiration: Sunrise and Sunset. I’ll be sure to post pictures when they arrive, but don’t let my children have all the fun … order one for your kids (or for yourself) on her Etsy site. … and may all of your days be filled with marvels, magic, and a child’s innate sense of wonder. Next post: It’s Cold & Flu Season … Salt Room/Halotheraphy, Anyone?